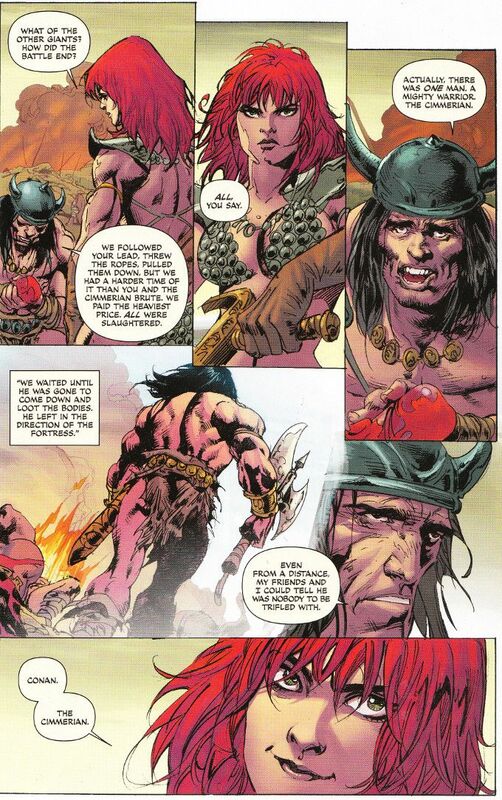 Compared to the excellent Conan/Red Sonja series it was meant to follow-up, Red Sonja/Conan #1 was something of a disappointment. With its second issue, this mini-series has ceased to be a disappointment and developed into a full-fledged travesty. Not only does this comic not deserve to be mentioned in the same paragraph as Gail Simone and Jim Zub's earlier saga - it doesn't deserve to be on the same planet! The artwork by Roberto Castro continues to be half-finished throughout. Yet the artwork seems even worse than last month's issue because of the misshapen and Cronenbergian appearance of most of the characters. The only character whom Castro appears to put any effort into depicting is Red Sonja and then only to ensure she has just enough circles covering her naughty bits to be considered decent. The story by Victor Gischler proves equally lackluster. The humor of the previous issue has vanished completely. Worse yet, not only does this chapter break the classic storytelling rule of telling, not showing us the action - it has an enemy warrior describing events to Red Sonja that she already lived through and doesn't need to be told about! The story gains nothing from this "As you well know..." perspective and readers will gain nothing from reading this book.